I wrote in my first book, "Secrets of a Professional Dog Trainer!" about the Three Keys to Successful Behavior Modification: Timing, Consistency and Motivation. These are three concepts that are especially important to the RVer who travels with their dog, because we're consistently putting our dogs in new and tempting situations where it's important to be a good ambassador to the general public, as both an RVer and a dog owner. Understanding how these Three Keys work together is probably the single most important concept you must learn, if you wish to get inside your dog's head and understand how the dog's mind works. Even if your technique is not perfect, you can use the Three Keys to analyze and figure out how to fix pretty much any dog behavior problem... especially important if you travel with your dog. The first key is Timing: Timing is your dog's ability to associate either a positive or a negative outcome with any behavior. (Or, as the result of any behavior). Since dogs have a very limited use of logic and reason, they are unable to associate cause and effect beyond what happens in the immediate present. That is, whatever happens as a result of their behavior (good or bad) must happen pretty much instantly. For example: If your dog smells the pan fried steak you're cooking and jumps up and puts his front paws on the hot stove: your dog's association with the hot stove will be: Stove = hot. (A negative association, that happens instantly). Yet: If your dog gets into a 4 lb bag of peanuts and eats them all in a matter of minutes... and in an hour he has painful stomach cramps and diarrhea; he'll still have no idea that the peanuts were the cause. Because for him: If the result or reaction of his behavior doesn't happen immediately, then his limited logic and reason (or in some cases: his limited language comprehension) prevents him from ever learning that 4 lbs of peanuts will cause gastrointestinal distress. So, it's our responsibility to attach an immediate negative association to eating anything that isn't in his food bowl. Or for any unwanted behavior, for that matter. 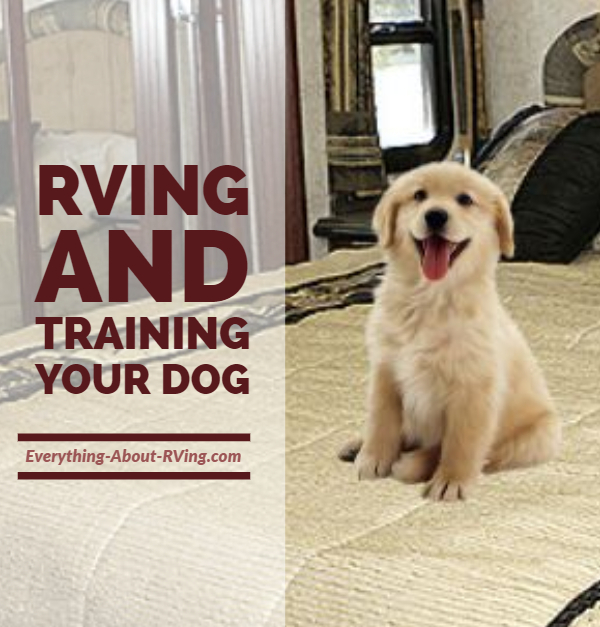 Frequently, RVers who travel with their dogs will ask about behaviors such as "counter surfing" ... where the dog jumps up on the kitchen counter to snag a piece of food. Owners wonder how to correct such a behavior, especially if the dog steals a piece of food and then runs to the other side of the RV (or under a table)? That's where the bridging technique comes in. As soon as s/he does the behavior -- even if you're on the other side of the RV-- you need to firmly say, "No, no, no" as you run to her/him and administer the correction. By saying "No," right at the moment she does it, you're creating a virtual snap shot in her mind, and by continuing to say "no, no, no" as you run to her, you're forcing her to remember what she's being corrected for. Studies I've read suggest you have at least 7 to 9 seconds after the behavior, as long as you're using that bridging technique. So, yes; You should be correcting her after she's jumped back down off the counter, as long as you've said, "No!" The same goes for timing your praise... which I'll go into more detail in a later article. Copyright 2011 By Adam G. Katz and DogProblems.com. All Rights Reserved.